Location, Location, Location!!! 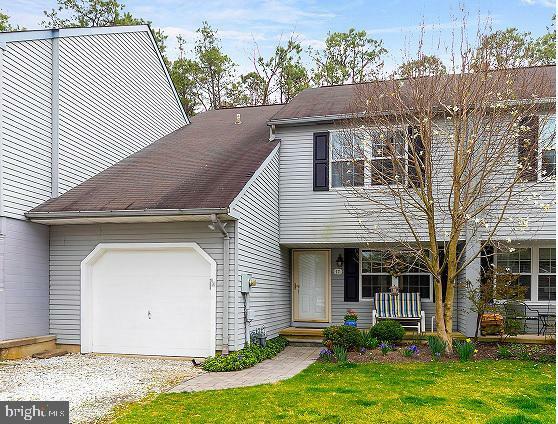 This beautifully updated and well maintained 3 bed townhome with 1-car garage backs to the Links Golf Course and is located in the desirable Kings Grant section of Marlton. Notice the new paver walkway to the covered front porch. As you enter, the remodeled eat-in kitchen boasts Thomasville cabinetry, granite countertops, stone backsplash, stainless steel appliances including built-in microware, ceramic tile flooring and more. The spacious living and dining rooms feature brand new carpeting and an Anderson slider leading to the rear grounds. Enjoy private views of the wooded buffer, lake and Links Golf Course from the 20 x 16 paver patio. The remodeled powder room includes upgraded vanity, fixtures and hardware. Ascend to the upper level where youll find the master suite and private bath. Two additional spacious bedrooms and remodeled full hall bath complete this level. Hall bath features include all new sink/vanity with granite top, ceramic tile flooring, tub/shower with ceramic tile surround, commode, fixtures and hardware. The washer and dryer are also conveniently located on this level as well. Additional updates include new beige carpeting in living & dining rooms, stairway and upper hall, replacement windows throughout (approx. 4 years old), HVAC & H/W heater (approx. 5 years old) and front paver walkway (1 year old). Garage includes automatic door opener and additional storage. Ownership includes use of the many amenities that Kings Grant has to offer including the swim club. Dont miss this opportunity to live in a great community nestled among the trees and open spaces of King Grant. Kings Grant isnt just a place to live its a life style! Fishing, boating, tennis, golf, hockey, basketball, volleyball, nature trails, tot lots, swimming pool and numerous nature trails await you in this great neighborhood. Conveniently located to nearby top-rated schools, shopping, including the Promenade shopping center and access to major highways.